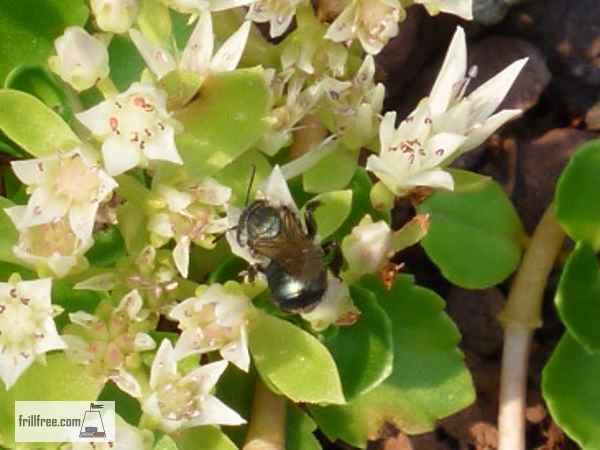 Before there were honey bees, solitary bees did all the work of pollinating plants in gardens; blue faced bees, mason bees and many other species of these smaller cousins of the domesticated honey bee live in your garden and in wild places. They're perfectly adapted to the local climate and conditions; some live in the ground, others build a nest of mud inside hollow grass stems or knot holes. 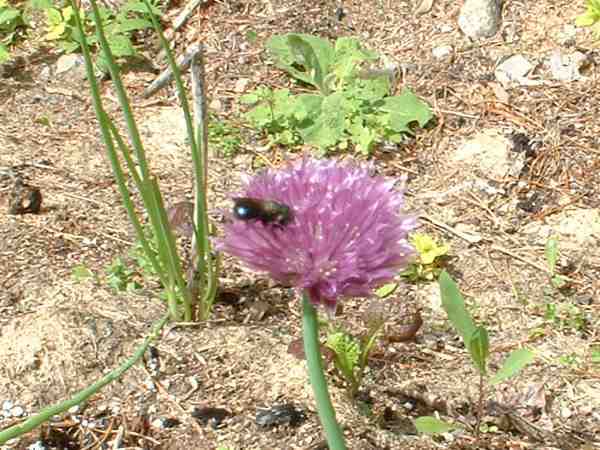 Generally, these are very small bees; some are almost too small to see with the naked eye, others considerably bigger. All are busy visiting native flowers as well as other garden plants. Some of their favorite plants have lots of pollen, which is what they feed the pupa after they hatch from the eggs laid inside the straw or tube. 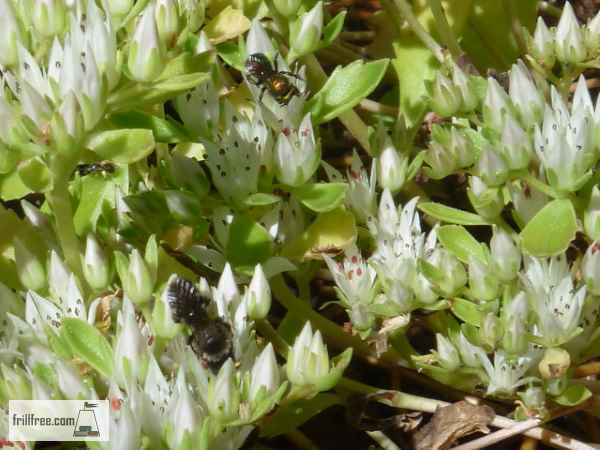 These are common in most gardens - chives, stonecrop and many other perennials are ones you'll spot these tiny bees clustering around. They usually live singly, sometimes grouping together to nest in the same place, but they don't live in a community hive such as many wasps and other bees. You can easily attract them to your garden to pollinate fruit trees by making a bee house; there are many designs, but all consist of some way of providing a small tunnel for them to lay their eggs in. Each female bee is responsible for gathering pollen and building a mud plug to lay an egg in - some cells have multiple eggs, all in sequence, each with a small amount of pollen to keep the larvae growing happily until it metamorphoses into an adult bee and digs it's way out. Build your own bee house - they'll need to be kept dry, such as under the eaves of your house or shed. The bees need to have access to some kind of mud to fill the cavities once they lay their eggs. You just stand back and watch the fun! 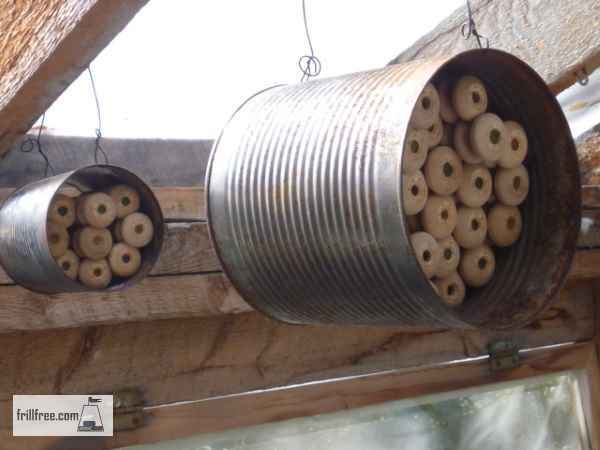 You can make your own mason bee house! Make several, so the solitary bees have a safe place to live.